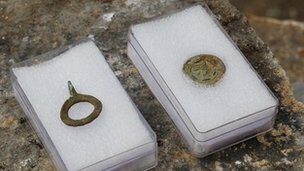 A "rare" Saxon brooch, a medieval harness, pottery and animal bones are among items found by archaeologists at Northampton's medieval castle site. A survey of the land is taking place ahead of work to build a new £20m railway station in the town. Tim Upson-Smith, from Northamptonshire Archaeology, said the team had discovered elements of the site's Victorian, medieval and Saxon past. He said he hoped the finds could be displayed in the new station. Archaeologists are expected to remain at the site on Black Lion Hill for eight weeks before West Northamptonshire Development Corporation (WNDC) can begin work on the first phase of the new station. So far, they have uncovered Victorian granite tiles from the town's old railway station, and medieval soil layers dating from when the castle was in use. 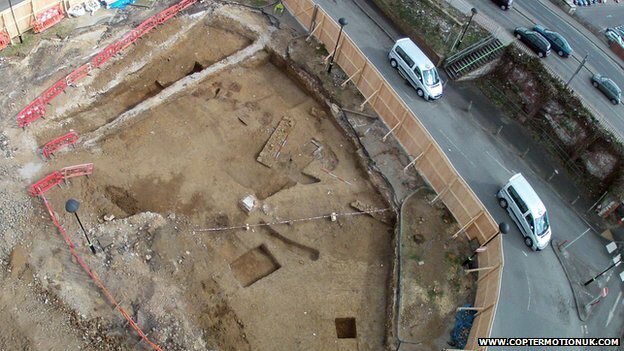 "Below that we're getting elements of late Saxon activity that pre-dates the construction of the castle in the 12th Century," Mr Upson-Smith said. "It's exciting for us as archaeologists to see what was here before the castle, as well as getting to see parts of the castle itself." He described the Saxon brooch as a "star find". "It's one of only two of this type known in this country," he said. Medieval pottery, animal harnesses and bones, as well as wetstones used to sharpen knives suggested "domestic things had gone on here," he said. "If we can have some of this displayed within the new station, then all well and good," he added. Roger Mendonca, from WNDC, said: "Once the archaeological work is complete and we can see everything that's been found, we'll look at the best way to make sure it's available for people to see." Work on Northampton's new station is expected to begin in the summer.